Love the sprint to the kid/spouse who has a fish on. 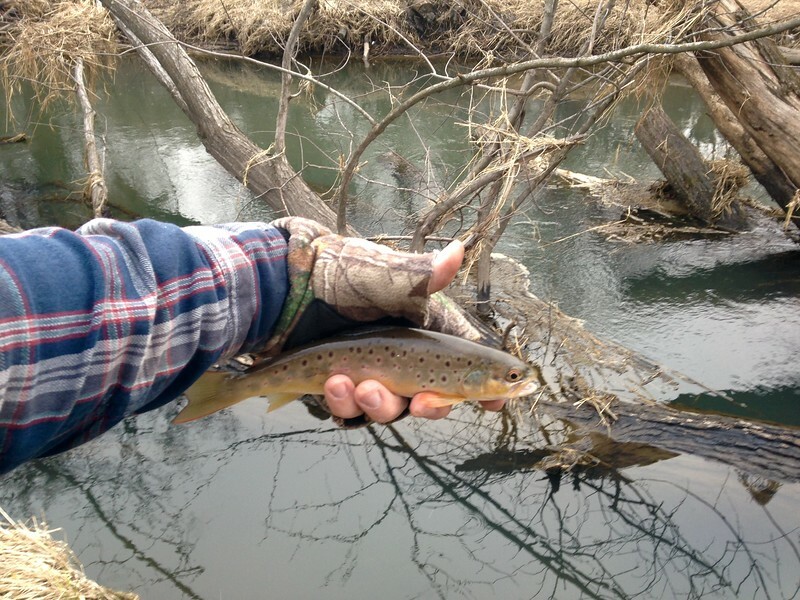 So last night I was fishing a wooded section of a medium to large stream that I hadn't been to before. I came upon a deep dark hole with a nice log jam in it. I knew there had to be a beast somewhere below and crept up on the spot to plan my attack. 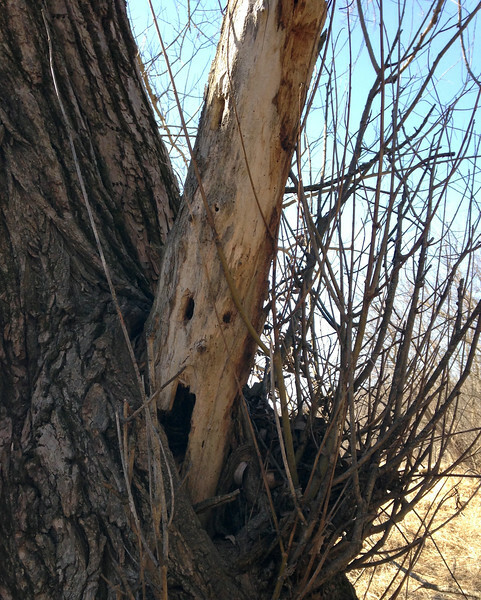 The woods around me seemed to grow silent with heightened anticipation. Took it as a great sign that I got some around 9am on this 30 degree April morning. 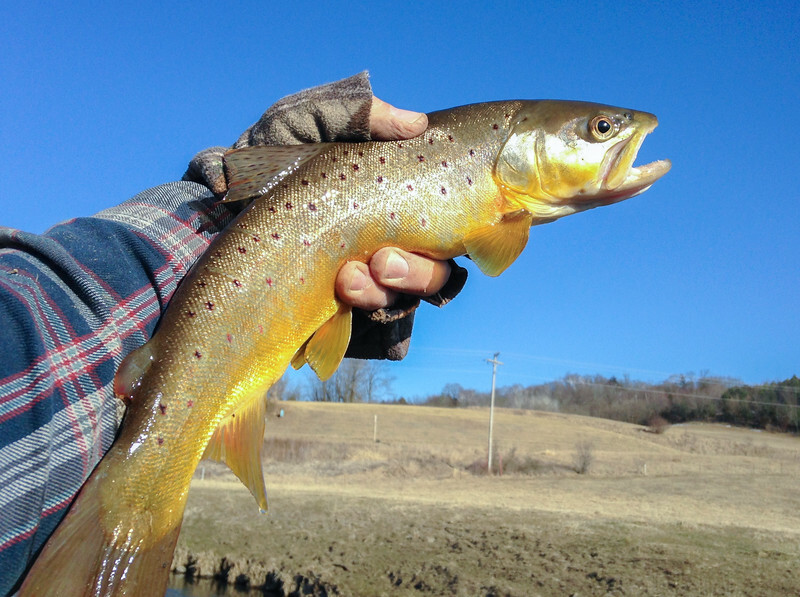 Also foul hooked a 16-17 inch Driftless trophy sucker in the deep pool right beyond the bridge, but he fell off when I lifted him. That one stung. 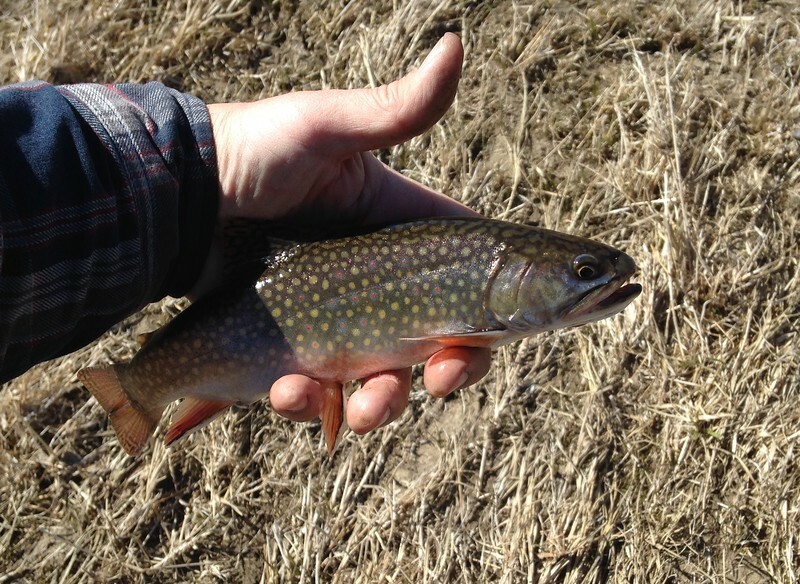 Lost a lure in this tangle (it's worse to the left out of frame) before getting this little brookie. Not sure it was worth the lure, but you never know what could be in a spot like this. 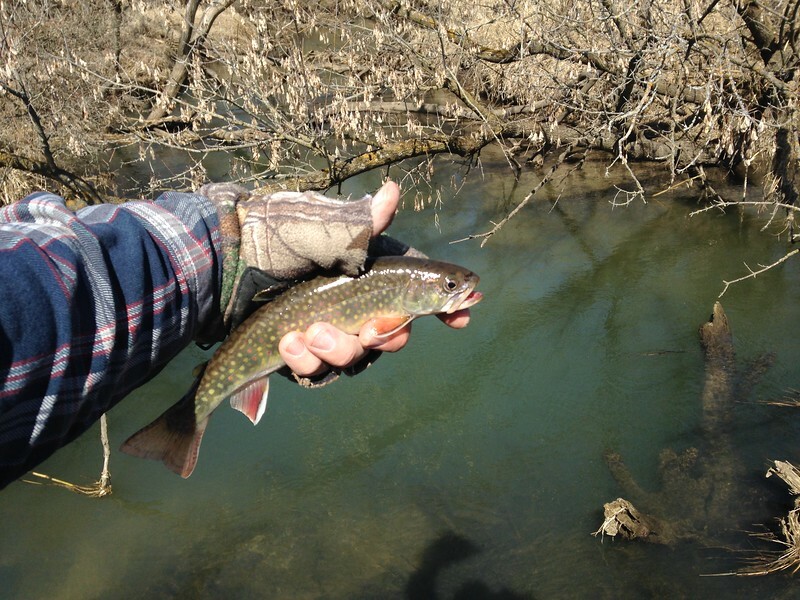 Was surprised to get a brookie as I was far downstream (several miles) from where I'd expect to see brookies on this particular water. As always though… what do I know? 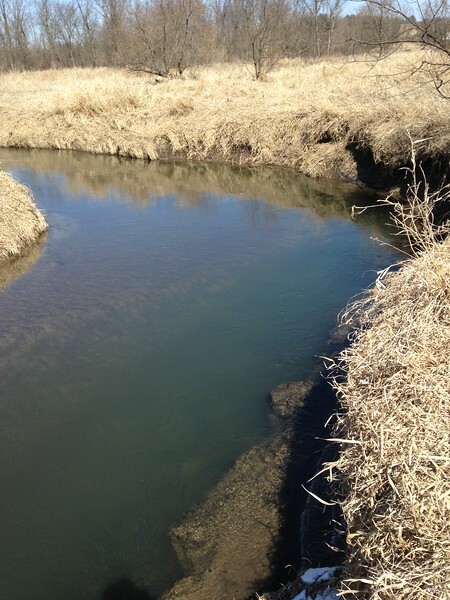 Being Masters weekend, went upstream to the golf course stretch of this stream and got a bunch of fish that would dart out from their side-stream undercuts. Not my favorite kind of water, but having a full and diverse day planned, including a fair amount of tough terrain, enjoyed the respite of this stretch and the easy pasture walk. Thought… Awww yeah, here we go! Loved the halos on this one though which always remind me of the RAF markings on a WWII Spitfire. 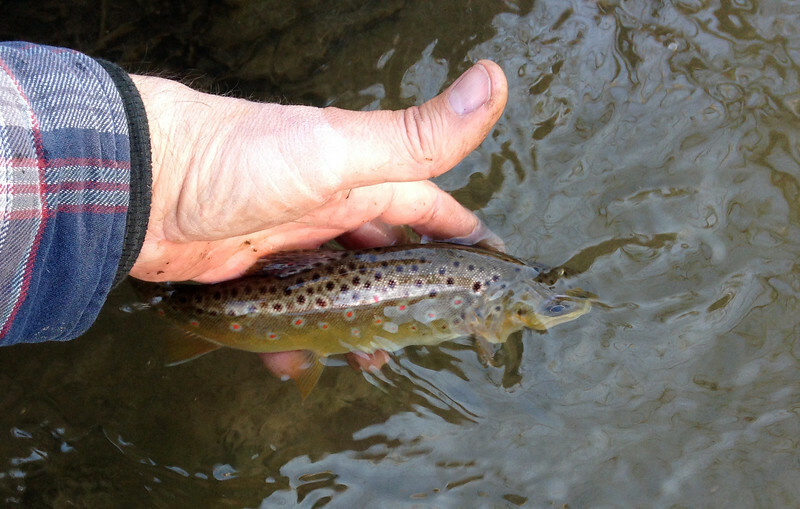 and the water was low and clear and there were no signs of any other decent fish – even in the deeper and darker holes and cuts, so left and headed downstream a few miles looking for deeper water. 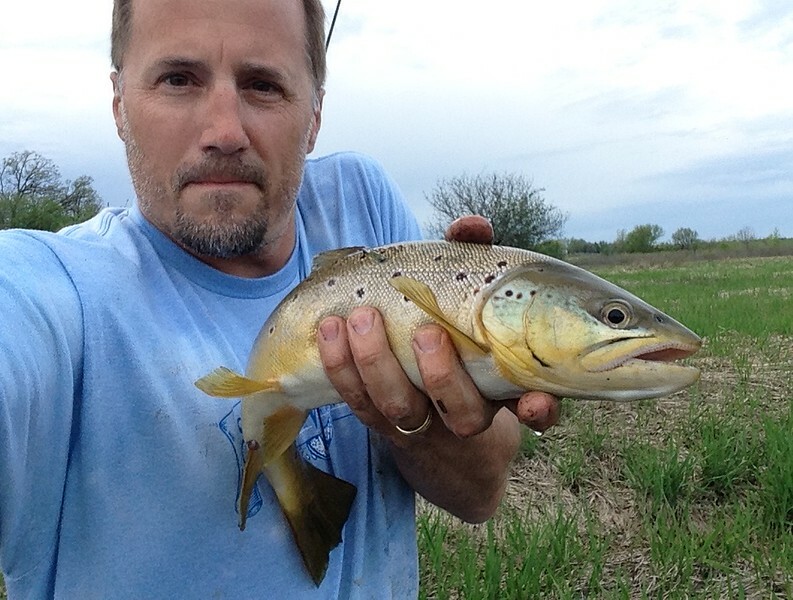 Got this fish up from a bridge in a corner hole that's behind me and over my left shoulder. Took the photo in the shade of the bridge. Sun blasted photo doesn't do the flame markings justice and I held him high to get the complement of the blue sky. Was a striking fish and was very excited for it. Great one to end the day on. Got out last night around 6 and fished for a couple hours. 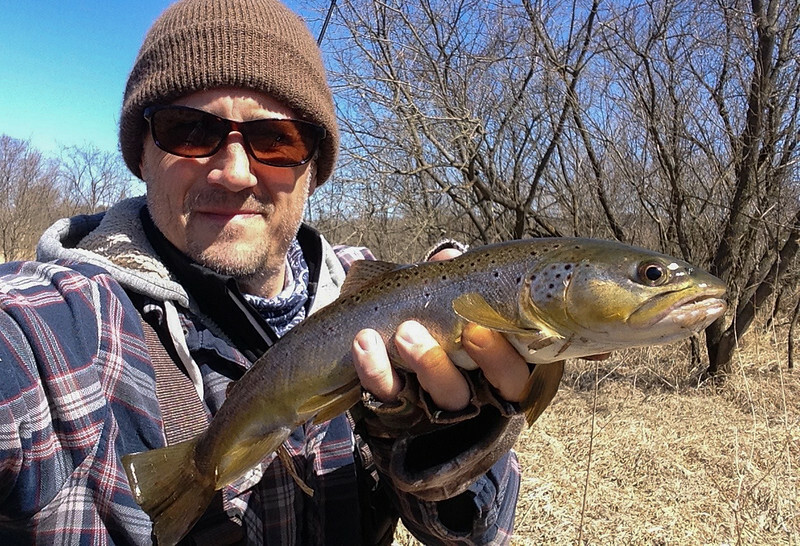 Hadn't felt the tug of a big fish in a bit, so headed to a big muddy – I've been fishing more traditional trout waters lately. Water was perfect as the recent rains have been a real help - up 8-12 inches and nicely stained with maybe 18 inches of vis. It's funny, but it's certainly possible to be off your game when it comes to this activity and I was last night. First fish I got on was a solid 16-17 incher and I managed to lose it by 1) Not being ready when it hit to get a proper set and 2) Not playing it out enough for an easy landing. Got off at my feet. Was not happy as it would have been a great start to the evening. Anyway, lost 4 or 6 more over the course of the night… a couple due to not having my head in the game for the set and a couple to playing them too fast and a couple just because I was flailing out there. Nothing that got away was a giant, but a few were quite solid in the 16-17 inch range. 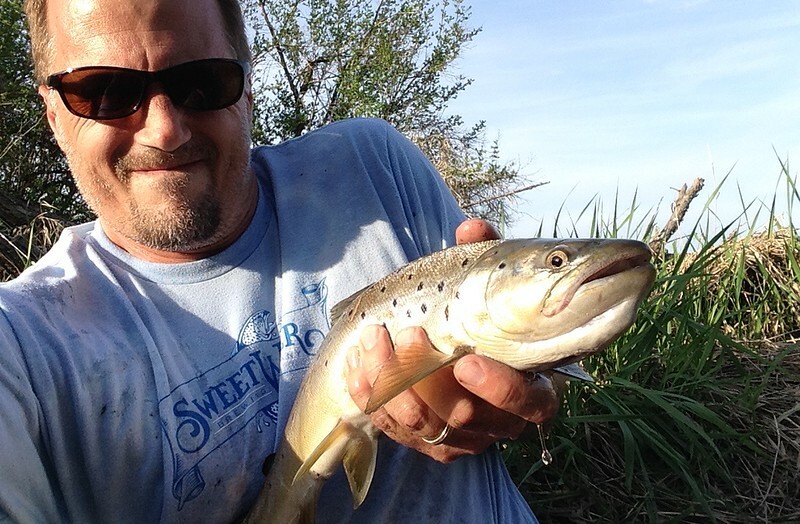 Still managed to land 6 browns and a stocker (10 inch) bow. A really good night for sure. 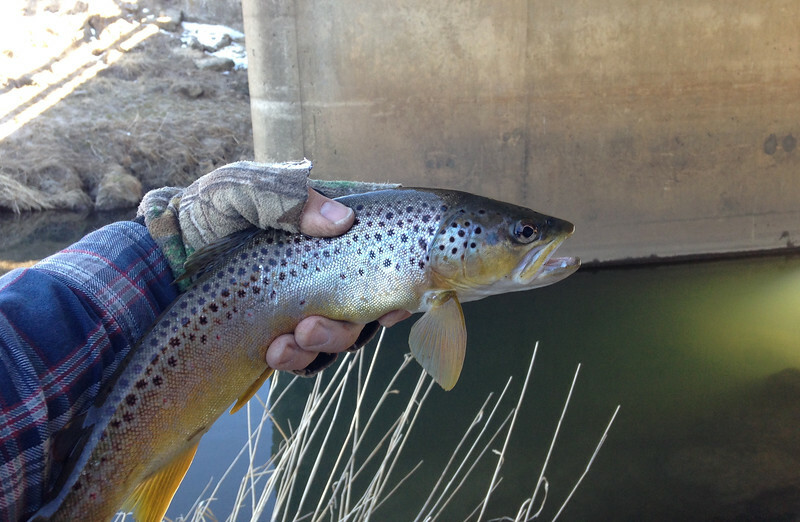 Of the browns, landed a 17, an 18+ and a 19.5 that I couldn't quite stretch to 20. I tried to lose the 19.5 by letting her get into a tuft of grass at the bank, but luckily the hookset was firm. Was a great fight and I even followed her downstream a bit like a salmon run giant - didn't want to lose her as I could see she was the biggest I had on in a month or more. Was the final fish of the night coz I lost a nice one further up by trying to reel it in too quick. Good to feel a big fish at the end of the line again. Good outing Gurth! Glad to see the local streams are back in business. 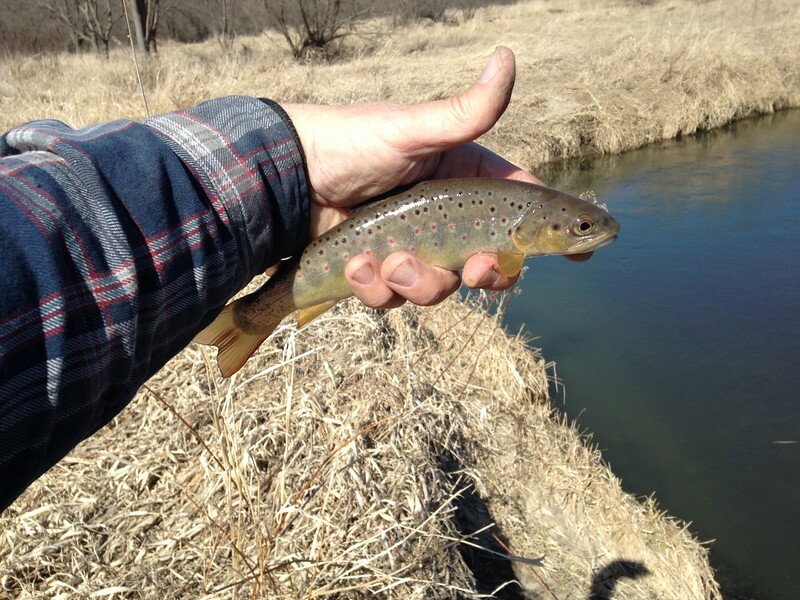 Funny how those Browns seem to stop growing just under 20". I've probably caught five that length over the years. Just can't seem to bust through that magical 20" barrier. 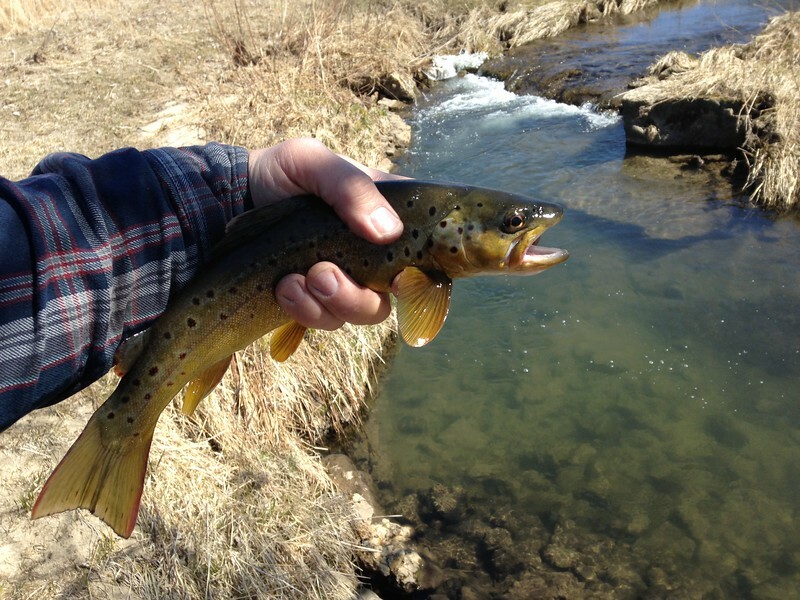 I suppose it would help if I fished larger streams more often. Yeah... bell curves being what they are but still... I've caught a lot of 19+ fish so there's definitely something to what they're typical max length is. I only measured this one coz I was "sure" she was over 20 and thought maybe 21. Guess I hadn't seen a big fish in a bit. No worries though... give me 17-19.99 inch fish all day long every day. 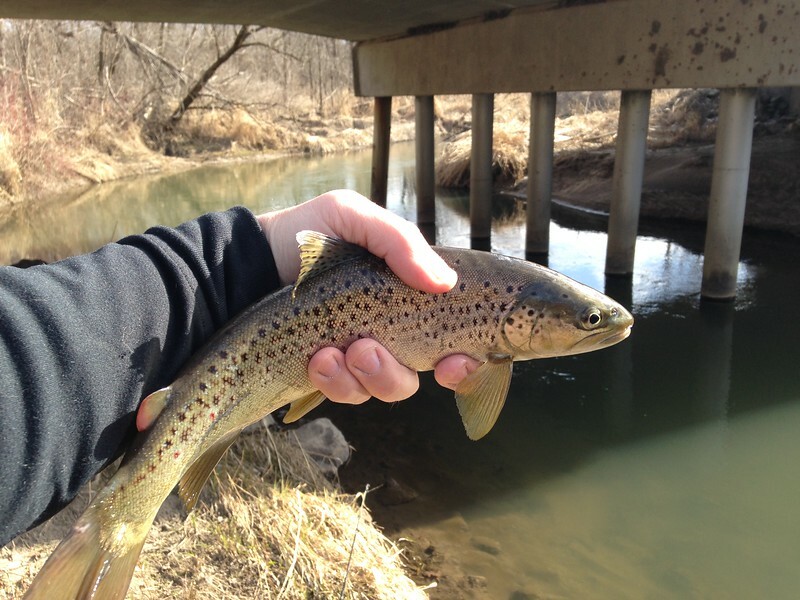 Stopped by a culvert yesterday on my way home from bass fishing looking for a cheapie or two. Got 3 or 4 dinks and lost a 16 that bit at my feet. 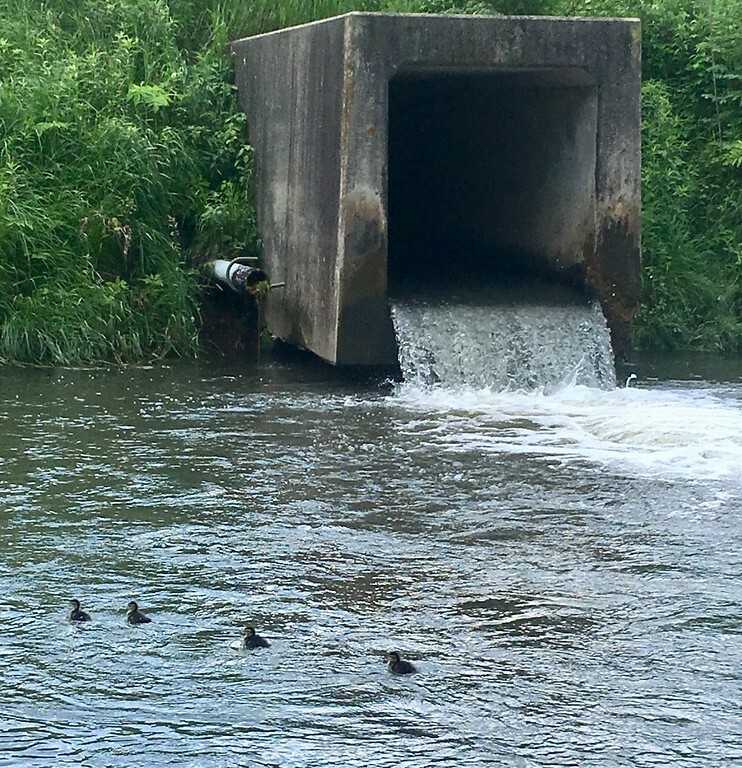 The most interesting thing was as I'm fishing, all of a sudden a duckling pops out of the culvert… riding it like a water slide in the Dells. Being a tree hugging bleeding heart where animals are concerned, was thinking I'd have to try and capture it and return it to the other side of the dam. Was gonna be a tough (impossible) task as the water in the pool is too deep to get in and the duck wasn't gonna just let me catch it. Kept fishing and noticed there were now 2 ducklings and then I saw a third ride the culvert wave into the pool. By the time I left there were 9 ducklings swimming around the pool and peeping away. No sign of mom yet so maybe more were coming down the tube. Yet another little vignette of nature that I got to witness as a result of this pursuit. I once watched a Muskie attack some ducklings on Pewaukee Lake (near Milwaukee). He grabbed one near a pier and then began chasing the others around while the mother duck frantically tried to lure him away. Every time she herded them to safety on shore, they would stupidly head right back into the water. Not the brightest animals out there. 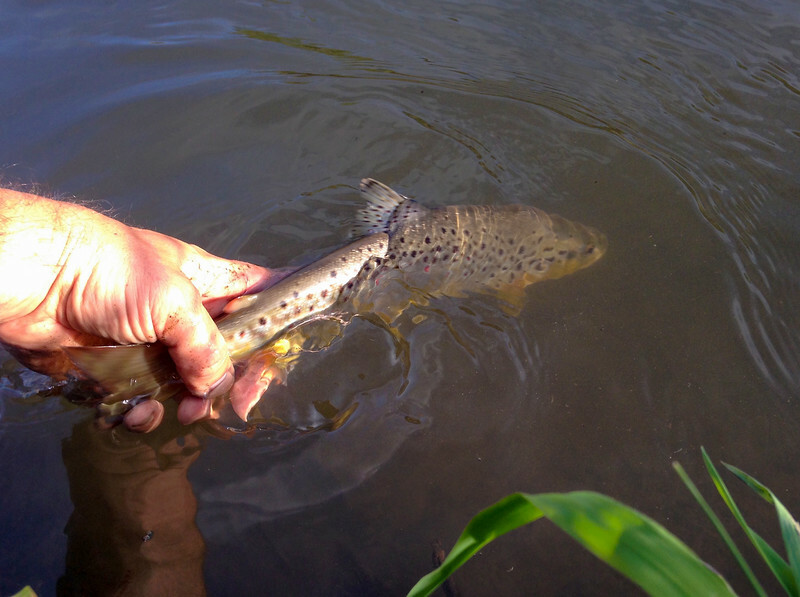 There is no doubt that big browns are sometimes (maybe always) in this particular pool although I have yet to get one. Was waiting for a top water explosion.